ACBB: Tell me a little bit about the build-up of the brewery. Peter Cole: My wife and I moved to Nackawic about 10 years ago and immediately fell in love with the area – a place to relax after a long work week! Nackawic is New Brunswick’s best kept secret, we think, providing many nature trails, as well as the beautiful Saint John River. Tatiana would cook special meals in the evening, and I would cook breakfast. We always wondered why no one started a business on the river for the locals, as well as the many tourists that visit. We finally decided that we would give it a try, and started extensive renovations on this beautiful, large home in January of 2013, converting it into a 3-bedroom B&B on the second floor. Renovations for the B&B were complete in September and we opened for business! The brewery was a longer process – started by having this location approved for commercial zoning, various permits for the extensive renovations, many inspections, more permits and licences, etc. Tuesday, April 15th, our first two beers were approved by the ANBL, so we’re now officially open for business! My friends Simon and Michelle Popowich have joined our brew team and are investors in the Big Axe Brewery… their support will help us be successful. What type of system are brewing on? After a lot of research, I decided on a 1BBL (31 U.S. gallons, or 116 L) system from Stout Tanks and Kettles. You spent some time earlier in the year brewing with some other breweries in the province… can you tell me a little about that? We were first invited to Shiretown in Charlo where brewer Derek Leslie let us brew with him, so we could learn more about the commercial brewing process. Hands-on experience is the best you can get! We later brewed with Stephen Dixon of Grimross Brewing; great to see how brewing is done on different equipment by different brewers. Very educational, to say the least. Most recently, we were invited to brew with Shane Steeves of Hammond River Brewing. Shane has the same brewing equipment as we do, so it was amazing to see our equipment at work! What are your plans for distribution? Any plans for growlers, bottling, etc.? We will be selling to licensed establishments and serving our guests. We are selling our own growlers onsite, as well as filling them once they are empty! We hope to be on tap soon at the King Street Ale House in Fredericton. I have had verbal confirmations from a few other establishments that are interested and eager to sell our beer. We will keep everyone posted when the time draws near. Can you tell me about the beer(s) you plan on offering initially? Are you planning on offering a specific style, or styles, of beer? Any seasonals, one-offs, or will you stick mainly with a “flagship lineup”? We now have two beers listed: Chantarelle Cream Ale and Double Bit IPA. We will be releasing our Maple Ale soon as part of our “Seasonal Selection”. Have you had any assistance from other breweries in Atlantic Canada? The support we’ve received from local breweries has been overwhelming. But we would like to highlight the support from Picaroons, Grimross, Shiretown and Hammond River Brewing! What will make your brewery different from other breweries in Atlantic Canada? Besides our “kick-axe” name, we hope our beer will be distinct from the local ingredients we add that grow naturally in NB! We also pride ourselves on having a beautiful location on the Saint John River. We are accessible by boat, ATV, snowmobile and we are only 3 minutes from the TransCanada Highway! I would like to see Big Axe Brewery expand to the point of distribution, hiring of employees and a local craft beer pub/bistro. A favourite beer? I am a craft beer enthusiast. I enjoy trying different beer from different breweries. The type of beer really depends on the mood, atmosphere and even the weather! But if I had to pick one… I would pick an IPA. I learned from a combination of people over the years, starting with my grandfather, but learned the most from the brewers mentioned earlier who we can now call friends. Sean Dunbar from Picaroons has also been very helpful and supportive. My wife and I have travelled extensively throughout Europe, Central America and the UK. We prefer going to local establishments so we can get the true sense of the atmosphere and culture. We make a point in trying a local brew from each place we visit. I have always dreamed of having my own business… and what better business to have than a brewery! 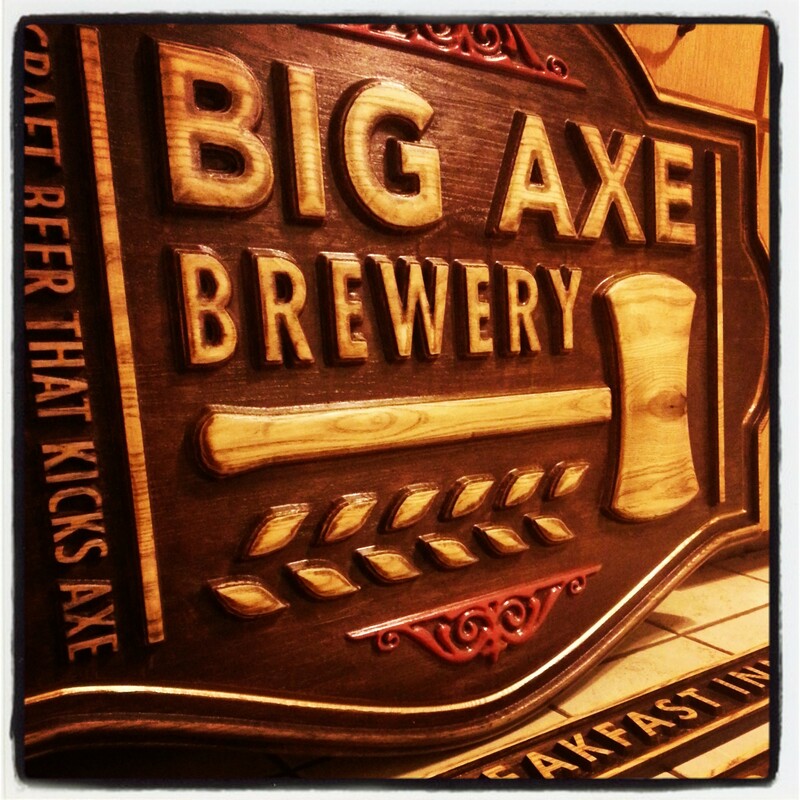 We’re happy to welcome Big Axe into the Atlantic Canada brewery fold! We’ll be updating regularly as they continue to increase production and availability; also, follow their Facebook page and Twitter feed for more information as it becomes available. In the meantime, be sure to drop by the brewery for growler fills, which are currently available Mondays-Saturdays, 12 pm – 8 pm. ← Friday Wrap-Up – Brew News from Big Tide, Red Rover, Gahan, Celtic Knot, Rockbottom, Picaroons, North, Bad Apple, and more! This is fantastic news and I wish Peter and Tatiana all the best with the new B&B and brewery! I think it wise that they hook their wagon to that of Hammond River Brewing when it comes to good, solid brewing advice. Peter & Tatiana have a beautiful location and they brew great beers. They have a great variety — stouts, reds, ales, summer beers and IPA’s. Their IPA is world class (my favourite). The hospitality makes the good beer taste better. Drop in.